Apple shifted the mobile biometry paradigm with its Touch ID sensor, embedded in the home key of the iPhone 5s for the first time, that actually "senses" your fingerprint the second you lay your digit on the round button. This method provides more convenience during the everyday interaction with your phone, as it avoids the extra "swipe" motion that we used to associate with finger scanners up until then. Besides unlocking the display, you can also use the sensor to ID purchase authorizations for your iTunes account, instead of keying in credentials, too. Samsung and the rest of the mobile crowd quickly followed suit with touch finger scanners of their own, and now there is barely a high-end, or even upper midrange phone announced without a fingerprint reader, whether it's at the front, on the back, or even on the sides. In the meantime, not only Apple's stock apps got a good use of Touch ID, but third-party app developers are also taking advantage of the extra authentication layer provided. They can do this because Apple has "sandboxed" your fingerprint readings on a hardware level, securing it in the respective chipset department, and doesn't show them to third parties by pinging the locked information directly. 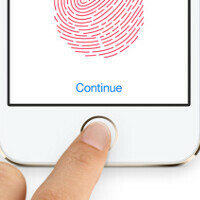 In any case, many third-party apps have now taken advantage of Apple's secure fingerprint authentication with Touch ID, and we are rounding up some of the best and brightest below for you to try out. Touch ID is all about security, and if you are thinking of a must-have security app, look no further than 1Password. Don't sniff at it just because it's famous - it's one of the best password and secure note storage lockers. It keeps all your hard-to-remember passwords handy, and can function as a password generator with Touch ID support, too. One of the most powerful and full-featured document management and office productivity apps for iOS, GoodReader supports secure access and editing via Touch ID, used to protect saved signatures as well. If you are in the market for a mind-bogglingly versatile file manager, editor and sharing platform, again look no further than GoodReader, it's well worth the five bucks. Everyone's favorite money manager has hopped on the Touch ID bandwagon, too, providing you with a way to securely access your budgeting tools without keying in cumbersome passwords. Check out How to Set Up Touch ID for Mint.com by Brenda Lawrence on Snapguide. Most of the banking apps now support Touch ID authentication, but how about using it for other financial shenanigans? Stock trade commissions are no big deal if you're buying in the hundreds of thousands of dollars, but if you are a small time retail trader, or someone just taking it up out of curiosity, the chances are that you will be buying and selling more often than advised in the business books, so minimizing your commission expenses would be highly desirable. Enter Robinhood - it offers free trading for self-directed retail investor accounts, and is beautifully tailored for mobile device usage. That doesn't mean you will be lacking in features, though. You can view quotes in real-time, place market, limit, stop loss, stop limit, and good till canceled orders, create a stock watchlist, preview charts and historical data. Open and closed market times are color-coded, there is two-step authentication security with Touch ID in the driving seat, and Robinhood Financial is a member of the Securities Investor Protection Corporation (SIPC), so your account is protected up to $500,000. The famed one-click ordering has never been easier than on your iPhone or iPad, requiring only a slight touch of your fingerprint to authorize a purchase, and get it on its way to your doorstep. The best way to use it is turn it upside down so you're always giving the iPhone the thumbs down. Bank of America uses it and I love it! I came in here specifically to make that post. I got BofA and it's absolute best thing they added to their app since "check depositing". I have to check my balances few times a day for my business account - not typing that damn password with numbers, uppercase/lowercase, and punctuation point that they require you to include is a bliss. Can you guys make something like this but for samsungs fingerprint sensor?